Be different, stand-out, and sell more. You have limited space, you are surrounded by your competition on the shelf, and you need to engage your customers—make the most of your space by being more visually appealing. Clever designs, die-cut openings and innovative carton structure can deliver more impact and improve shelf presence. 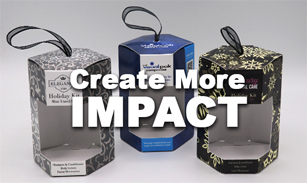 By leveraging strategic package design, our team of designers takes your products to a new level. Our experienced staff collaborates to understand brand direction. Considering consumer and retail insights, we dovetail our designs to create budget friendly concepts, shapes and layouts that can be efficiently packed and dazzle on the retail shelf – and with greatly reduced lead times too! A recent design scenario: Looking for a unique construction paired with an auto-bottom to aid with assembly, our customer came to us with a carton that had a serious production demand. The uniquely shaped carton had to have an auto bottom so desired fill rates could be achieved. Flexible to hold multiple items, it had to show product within a die cut window – while keeping the varying bottle heights all safely secure. The final embellishment? It needed to look like a holiday ornament– and arrive ready to go. Our team was up for the challenge. The final result? 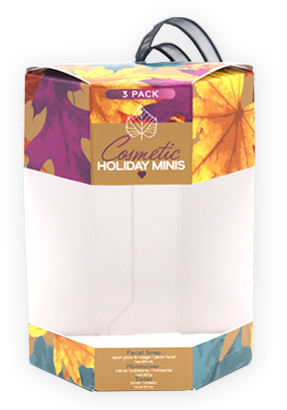 A robustly designed hexagonal carton with distinct panels, a die cut window, embellished with 4 color printing, gloss aqueous coating, a foil stamp AND an applied satin ribbon – on time, under budget, dynamic, and easy to assemble!